Fear is the oldest emotion possessed by humanity. Death and what might or might not lie beyond the mortal coil is, quite possibly, the origin of fear in and of itself. As mortals, death is inevitable. We don’t have the luxury of actually knowing what happens when we die, therefore we have two options where death is concerned; we accept it as a part of life, or we live in fear of it for the duration of our living days. In the World of Darkness, however, there is always a darker shade of gray to be found nestled betwixt black and white absolutes. At the very least, the World of Darkness is a haunted place where ghosts sift through the shadows and walk amongst our settings and characters. Sometimes the dead come back. They can’t all be pleasant, as they are intense reflections of the situations surrounding their lives and subsequent deaths, and a lot of times they exist in spite of mortal belief as often as they exist being fueled by the passions of those who refuse to forget them. Ghost Stories is, in many ways, a textbook that looks at the anatomy of the ghost and of hauntings in component pieces. The ghost story, at least as we know it in modern times, is quite possibly the eldest form of dark fiction that exists in our world. The concept of something beyond the stasis of death – the afterlife, if you will – takes on as many different forms and functions as there are cultures of humanity. This being the case, what Ghost Stories attempts to tackle is the basic formula of the ghost for the purposes of storytelling. Telling a ghost story for the purposes of game play is a heck of a lot different in many cases than just sitting ’round the campfire sharing re-hashed urban legends. At the same time, following the same old same old of the vengeful ghost who was murdered and who has come back for revenge time after time is no small amount of predictable, if not dreadfully boring… and Ghost Stories does a good job of both telling as well as showing where using ghosts and haunts in the World of Darkness is concerned. Written by Rick Chillot, Matt Forbeck, Geoff Grabowski, Matt McFarland, Adam Tinworth and Chuck Wendig with some exceptionally inspiring interior artwork provided by Sam Araya, Jim DiBartolo, Anthony Granato, August Hall, Michael William Kaluta, Josh Timbrook and Jamie Tolagsun, Ghost Stories serves as a companion source for use with the core World of Darkness rulebook. Presented as a resource specifically designed for mortal characters in the World of Darkness, Ghost Stories is intended as a primer or, if you will, a starting block for World of Darkness chronicles that start out sometime before the sunset in a world that comes alive sometime around midnight. The supernatural doesn’t always have to be an in-your-face phenomenon, and some of the best chronicles that you can run are those where the World of Darkness embraces the player characters slowly into its caul over several sessions. Ghost Stories is the sort of book that lends perfectly to this sort of chronicle. The Introduction of Ghost Stories serves as a breakdown of the ghost story into its most rudimentary parts. Covering the basics, such as why a ghost is a ghost, why a specific place or object might radiate with paranormal energy, how to plan out a ghost story of your own on paper or in your mind before the game begins, the first few pages serve to prime the Storyteller who might not have the slightest idea as to where to begin with a ghost story of her own. For more experienced Storytellers, the introduction provides a great model for an outline and for ensuring that all of an ST’s organizational needs are kept in order. Sort of a logistical checklist, if you will. Stats and background information are also provided for a handful of ghostly types that an ST might utilize in her own story, or for on-the-fly antagonists or NPCs at a glance. The bulk of the book after the Introduction offer a series of ghost stories written as examples as well as for utilization within a chronicle. There are many different types of ghosts, and for each type, there is most definitely a story. While the types are presented along with ready-to-use accessories, the stories are up to the tellers to create. Basic plots that are very easily modified to fit the needs of the ST are included in each chapter, as are NPCs and descriptions of locales, etc. to beef up or to inspire a ghost story of your own. Chapter One: Dust to Dust covers not so much an individual who has died and returned to haunt the living as a place. In this set of tools, the ghost story outline is for a town. Chapter Two: The Terrifying Tale of James Magnus gives up its ghost in the form of a Legend of Hell House-esque scenario. Chapter Three: No Way Out covers the conceptualization of the horror and happenings that might come from a ghost that is a result of a suicide. Chapter Four: Roots and Branches takes a look at the classic concept of the “haunted forest” or the “sour grove” or what have you, and finally, Chapter Five: Holy Ghost provides the skeleton for a story that incorporates the vengeful ghost driven by a mission. None of the chapters are written from the standpoint that they are THE way that a ghost story should run, but rather resources provided by professional story tellers to give the amateur a leg to stand on and some ammunition for her own chronicle in her own World of Darkness. One of the best aspects of Ghost Stories, in my opinion, is the fact that it is a book that works as well with the current incarnation of the World of Darkness as it does with game systems of yesterday such as Wraith: The Oblivion and Orpheus. There’s a lot of exceptionally handy information within the covers of Ghost Stories, especially for anyone who might be new to utilizing ghosts in the World of Darkness. While veterans of Wraith: The Oblivion might not find the contents of Ghost Stories all that new and exciting, the manner with which the authors have presented their information – the step-by-step approach and the linear style to the information as provided within the chapters’ scenarios – is sure to help in the construction of the ghost story, which goes towards the betterment of the story being told as a whole. 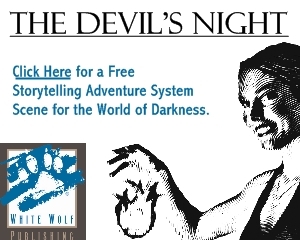 This is the first of the “World of Darkness 2.0” resources that I’ve picked up since the renewal of the World of Darkness as a whole by White Wolf. What I think that I like the best about this resource is the focus that, at least to me, seems to be placed on giving a Storyteller the best possible advice and guidance for becoming an even better Storyteller. 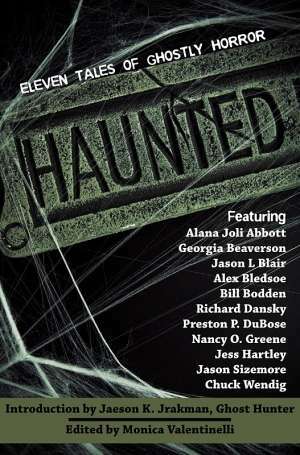 Don’t get me wrong, there is a lot of interesting information and a lot of creativity inclusive with the scenarios, and some of the setting elements in and of themselves are downright fantastic (Chapter Two is one of the best examples of a Haunt – or the foundation for a Nihil – that I’ve ever read, as an example). The general gist of the book is not so much on things to throw into your chronicle – kewl powerz, as such – as it is on how to tell a story that can scare the socks right off of your players if executed with a little foresight and finesse. Given the textbook presentation and how-to feel of the book coupled with the sheer quality of the skeleton scenarios as written, Ghost Stories is a resource that is more than a little useful to anyone who wants to tell an all-Mortal chronicle or, if not, to incorporate ghosts and haunted locales into their existing World of Darkness to shake things up a little.